New York Times bestselling author Gregg Olsen has has written many adult crime novels, often based on gritty real-life crimes. He has turned his talents to the YA market and has published two books in the ‘Empty Coffin’ series, Envy and Betrayal. The books are set in picture-perfect small-town America and feature twin heroines Hayley and Taylor Ryan. Like his adult novels, his YA books are heavily-inspired by real-life events. Gregg spoke to Book Events for Children during his world-wide book tour. After writing such successful fiction and non-fiction books for the adult market, what prompted you to move from writing for adults to writing YA fiction? In my true crime writing, I have always been touched by the young people who have been victims of crime. Many of my adult books feature children who have had the unthinkable happen to them. When I started writing adult fiction, I included many young people as characters. The idea of writing crime stories FOR young people came out of that experience. Your YA novels draw on real-life crimes. What do you feel are the responsibilities of writing about traumatic events for a relatively young audience? I try to keep the stories as true to life as possible – in a lot of ways my young adult readers expect that. They are quite sophisticated when it comes to crime-solving techniques. Most of that comes from watching TV, of course. In my books I am always mindful about such things and I make sure my books don’t talk down to the readers of a younger age. Having said that, I always strive to make sure that the emotions swirling about the young characters are true and considerate. Envy, the first of the ‘Empty Coffin’ series explores the tragic death of a teenager following cyber-bullying. As the father of twin daughters, is this an issue you feel strongly about? Yes, I am very concerned about cyberbullying. It is a huge problem facing teens (and even younger) kids today. I have heard many heartbreaking stories from kids who have experienced it. Whenever I find the chance, I remind people that the dark side of the internet is a very dangerous place and we need to protect our children. 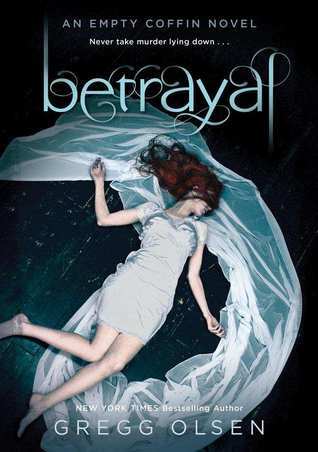 Betrayal, your latest book in the ‘Empty Coffin’ series has recently been published and has obvious parallels with the Amanda Knox case. What prompted you to write about this subject? I was fascinated by the Amanda Knox case and the media’s role in presenting it to us – her in your country, and at home in America where I live. I must admit that at first I bought into the idea that Amanda Knox was a cold blooded killer. There was no reason to think otherwise. As the story played out over time, it was clear that we really didn’t know what happened with Meredith Kercher and if Amanda was really the killer. I drew some inspiration from that case for BETRAYAL; It was really only a starting point, of course. The storyline in my book is not the Knox case at all. Can we look forward to more books featuring Hayley and Taylor Ryan, the heroines of the ‘Empty Coffin’ series? Yes. I am planning a third volume in the series that will take the twins Hayley and Taylor to the source of their special gift…and the reason they are able to do the astonishing things that they can do. You are going to be appearing at book-related events in the UK this month? Is there anything you’re particularly looking forward to seeing or doing while you’re here? For me, it is always about the people. I’m looking forward to seeing the young; (and not so young!) readers of my books. They inspire me so much. In fact, I don’t think I would have done the storyline of the Knox case if I hadn’t been here last time. Would you consider setting one of your novels in the UK? Maybe the twins could come and study over here and get embroiled in an adventure…?! I love that idea! I think that the twins should come to the UK, absolutely! I believe your book tour includes events in Hong Kong and the Philippines, as well as the UK. What do the next few months hold for you after your visit to the UK? I have a couple of new books coming out. THE FEAR COLLECTOR (Constable and Robinson) comes out here in a couple of months. This is an adult thriller in which a man believes that he is the son of a famous serial killer. I have a true crime book coming out in the States next year, and finally, I’m working on an exciting young adult novel. Lots to do, but hopefully not too much so that I can’t enjoy the holidays! Do you enjoy reading crime novels yourself or do you read a different genre of books in your spare time? I love crime novels. I don’t read nearly as much as I should or as I’d like. I don’t know if you’re aware of it but Harrogate in North Yorkshire has a thriving crime-writing festival each summer. Could you be tempted to journey ’up north’ to make an appearance? I would love to come to Harrogate. I’m not sure if is open to all, or by invitation. If you can invite me, please do!